“Pouring” Over Latest Cooling Tower Advancements | Manufacturers of Cooling Towers & Systems | Delta Cooling Towers, Inc.
Soy sauce producer optimizes operational efficiencies with engineered plastic cooling tower technology. If you can’t stand the heat, then an industrial food processing kitchen is not the place for you. For most food manufacturers, heat is not only essential to the operation, but also ensures consistent product quality and safety. However, in order to keep the process steaming along, it is just as important to control the heat with proper cooling techniques. Whether applied to heat exchangers or other chilling and cooling systems, dependable and efficient cooling towers are essential to the cooling process. If these systems are not operating effectively, the entire operation can be interrupted by unscheduled downtime that results in costly production losses and delayed shipments. When it comes to dependable performance and minimized maintenance, factory-assembled cooling towers made with advanced, “engineered” plastics continue to gain favor over the galvanized models that are predominant in food processing today. Just as plastics have overtaken metal in industries ranging from automotive to aerospace, plastic cooling towers have become increasingly popular for food processing applications. These more advanced models are impervious to problems such as corrosion that plague metal cooling towers and require untimely repair or replacement. Such was the concern of the maintenance engineers at the California processing facility for one of the world’s leading soy sauce producers, where a cooling tower is used to cool the process water that runs through heat exchangers to cool the soy sauce after brewing is completed. Due to the leaks and excessive scaling that were occurring on the tower’s metal-clad basin, the plant decided recently that it was overdue for a cooling tower replacement. “This was a traditional galvanized sheet metal-lined tower that was on its last legs,” says Jonathan Reimer, a millwright and general foreman with HMI Industrial Contractors (Rancho Cordova, CA), a leading West Coast mechanical contractor that services food and beverage processors. “The tower was at the end of its practical service life due to rusted-out perforations surrounding the basin,” Reimer explains. In the past, when considering a replacement cooling tower, many users simply swapped-out the old model with an identical new one. Reimer says that today it is more likely that users will consider an array of cooling tower options that use advanced technologies or design features that can extend the service life of replacement units considerably. 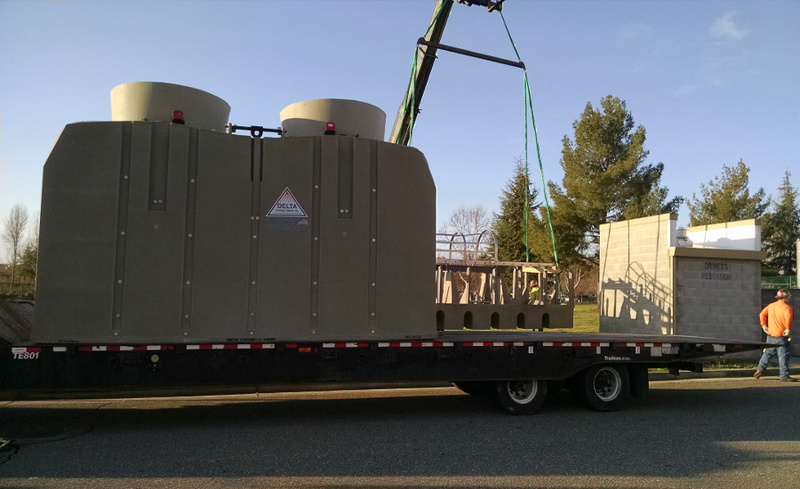 Reimer summarized the benefits resulting from the HDPE cooling tower design as “ease of everything,” meaning not just ease of operation, but also ease of upkeep, ease of maintaining chemical balance, and even ease of tower installation - which took just one day. The specific solution for the soy sauce plant was the twin-cell TM Series from Delta Cooling Towers. Of significant importance to the food processor was that the cooling towers are designed to be modular, which enables the isolation of cells for operational flexibility. In addition, with configurations from one up to six units, the modular TM design would allow capacity to increase at the plant, should future production increases be required, by simply adding another unit into the formation. The TM design is also available in single unit capacities from 250 to 2,500 cooling tons. The new replacement towers selected by the food processing facility have a cooling capacity of up to 820 tons in an induced draft, counter flow design. When users upgrade their cooling towers from galvanized metal designs, some may consider the much more costly stainless steel models. However, in Reimer’s experience, even stainless steel does not stand up to the elements like HDPE. In fact, some manufacturers, like Delta, offer a 20-year warranty on the engineered plastic shell as proof the design will survive the test of time. Among the other features of the HDPE cooling tower solution that were important to the food processor were the direct drive fan system (no drive belts that require additional maintenance) and totally enclosed motors with variable frequency drives (VFD). Reimer adds that the new HDPE cooling tower installation met the soy sauce manufacturer’s original objectives, and they expect the new reliable and economic performance of the towers to pay dividends far into the future.